With all the great Barleywines being produced currently in British Columbia I decided to hold a Barleywine tasting. The original idea was to taste every barleywine currently produced and bottled in BC. Due to a few people dropping out due to illness I had to scale things back just a little. It is flu season and all! I purchased all the barleywine and had the participants help cover the cost of the beer. We had also planned on sampling Old Barrel Dweller by driftwood as well as a few guest barleywines from elsewhere but lack of numbers changed this. I held the event on Saturday January 19th, 2013 and the reduced group was made up of Steve H, Stu C, Chris C and me. 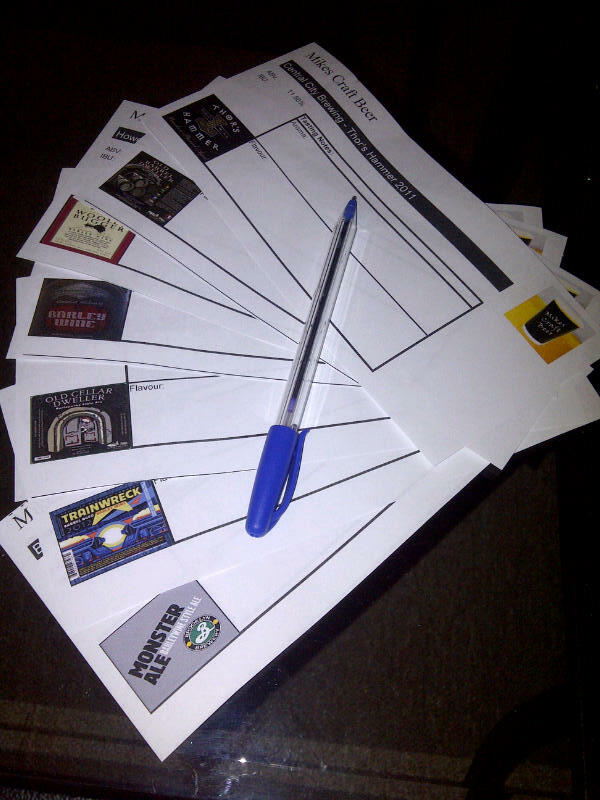 Each person was responsible for writing notes on the aroma and flavour of each brew tasted. Scores were not given due to distraction of the first Canucks game after the lockout. I do remember most of the opinions though. 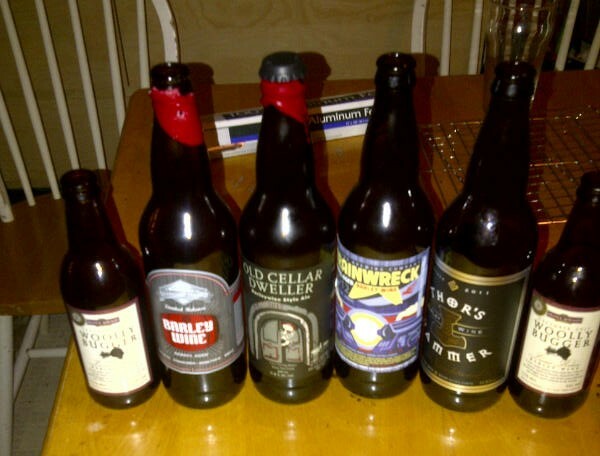 Of the five beer tasted 3 were very well received including the Thor’s Hammer, Woolly Bugger and the old Cellar Dweller. There was some varying thoughts on the other two though. I really liked the Granville Island Barley Wine and was not fussy at all for the Trainwreck while the other three had the exact opposite opinions. I think everyone agreed though that the top two Barleywines were Thor’s Hammer and Woolly Bugger (correct me if I am wrong I did get either the flu or one of the other bugs going around that knocked me on my but for half a week after this tasting). This was only the second tasting I have hosted and I still have to work out some kinks but we all had fun and enjoyed tasting great craft beer. Reviews I have already written will be updated with the notes from this tasting and any new reviews will be written with these notes in mind. All reviews will be linked back to this tasting page. This entry was posted in Tasting Event and tagged barley wine, barleywine, central city brewing, driftwood brewing, granville island brewing, Howe Sound Brewing, people, phillips brewing, tasting, tasting event. Loved the Wooly bugger and the Trainwreck this year. The Barrel Dweller wasn’t half bad either. It is tough to judge some of these though as they will only get better with time. Still need to give this year’s Thor’s Hammer a try! Wooly bugger was great and I did not mind the Barrel Dweller when I tried it earlier this winter. I still personally can not see to enjoy the Trainwreck yet. I think with age this will change though. Oh ya and Hammer was my winner this year! Thors hammer was my favorite and trainwreck was my least. All pretty good though! I remembered you mentioning it before, and then realized I had it too. It was good wasn’t it?